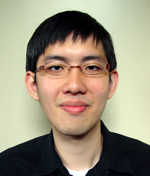 Chuan Sheng's research interests lie in the areas of machine learning and data mining. He has recently worked on two major research projects. The first involves the automatic tuning of regularization hyperparameters for a class of machine-learning models. In collaboration with a graduate student, Chuan Sheng implemented a solution based on deep understanding of the relevant mathematics that is both elegant and effective. A publication describing this work has been accepted by NIPS, a top machine-learning conference. The second project involves the prediction of RNA secondary structure. Chuan Sheng co-developed an innovative machine-learning based algorithm for the simultaneous folding and alignment of RNA sequences that is both more accurate and an order of magnitude faster than previous methods on realistic inputs. A paper describing this work is currently being written.